We constantly remind ourselves of this. As travel bloggers we are always looking to challenge the boundaries of adventure, asking ourselves what kind of experience is worth trying and why? We’ve explored the globe both near and far and still have so much yet to see. But when asked what travel experience we liked best, there’s one that stands out above the rest: Our incredible journey began in Queenstown, New Zealand. We decided to save up our pennies and try the world famous Over The Top Milford Heli Cruise. Now you may be asking yourself, “what is that?” Two words. PRIVATE HELICOPTER. 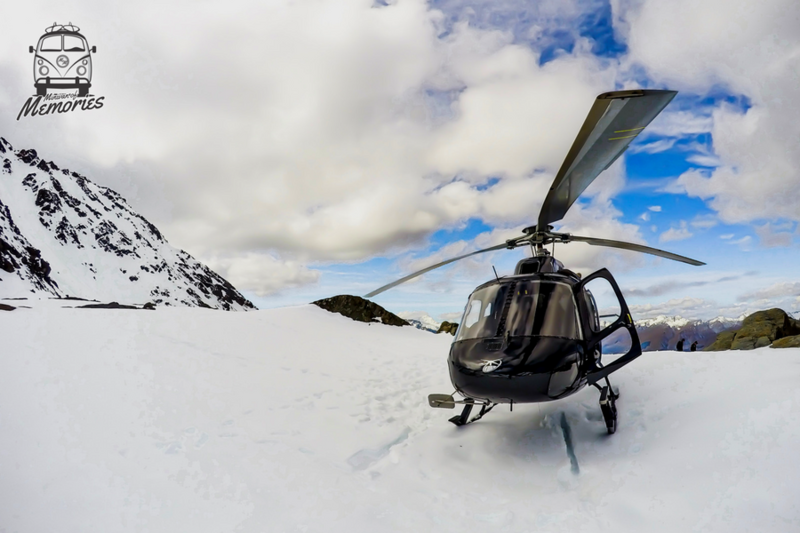 This particular tour takes you on a dreaming scenic flight to the Milford Sound with a few additional surprises in between. Our day began with a private driver escorting us to the airport (#HelloRoyalTreatment), where a beautiful sleek black helicopter awaited us upon arrival. After a few safety tips, we boarded our vessel and in no time were up and away. Navigating through cotton candy clouds, snow-capped mountainous terrain, and evergreen forests. In the distance, through the clouds, we slowly approached a landscape unlike any we’d seen before. There were jagged mountains surrounding us shooting straight towards the sky, covered in lush greenery as far as the eye could see with waterfalls cascading off their sharp edges at every turn. Our eyes were on sensory overload. (#SoNotEvenKidding). We landed in the hidden oasis of Milford Sound, where the pilot quickly escorted us to our next destination. Tickets in hand we boarded a relaxing cruise for a tour around the entire fjord, showcasing stunning green cliffs, calm dark waters, and frosty alpine peaks at every turn. After our cruise concluded, we boarded our helicopter yet again for an unexpected glacier landing. This snow-covered cliff edge provided us with panoramic views of majestic snowcapped mountains, lush green valleys and ice blue streams below. Which also served as the world’s best location for an epic snowball fight (#ThatHappened). We laughed, kissed and tackled each other in the snow. Completely soaked, we boarded the helicopter yet again, smiling ear to ear as we made our way back home. That dreaming day will be etched in our memories forever as a daring adventure that showed us just what life is truly all about. This memory belongs to our Passengers Lindsay and Alex (@aforeigner.abroad) . All the pictures belong to Linday and Alex's personal archive. To know more about our Passenger @AForeigner.Abroad, click here.